Both of the characters are introduced very early on in the novel, and we slowly build a picture of them. Hodges is retired, bored, and rapidly gaining weight, while Brady is elusive, weird – and basically a sicko! His relationship with his mother is truly disturbing. I found the book very readable, but I wasn’t sure that I really liked it that much, if that makes sense! 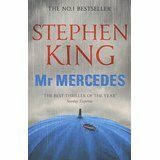 I think it is cleverly written, with the story developing well and the tension building nicely. But I didn’t really like any of the characters and it just felt dated and full of stereotypes, and the two main characters are both caricatures in the main. In some ways I liked that the characters were un-PC, as this of course reflects the real world, but I really could have done without Hodges perving at every blonde woman under the age of 50, and token black character Jerome’s street-talking alter-ego. But despite this, I wanted to keep reading the story, and was intrigued to find out what would happen. I did expect it to be darker, and possibly a few more twists at the end would have been fitting, but overall I think I liked the book, without really liking it. which makes no sense at all! And I probably wouldn’t read any of the other books in the trilogy – at least not for a while!